As it’s probably been noted – it gets pretty hot in most of Japan in the summer, so what could be better than a nice bowl of chilled soup? Over the years I’ve come to quite like gazpacho soup, made famous to my generation in the UK from the comedy ‘Red Dwarf’, where the character Rimmer ruins his career by asking the chef to ‘heat it up’ whilst at the captain’s table. The soup itself is Spanish in origin, so you can expect a lot of juicy ripe fruit in there. Anyway, I’ve digressed already, this soup is prepared chilled from fresh ingredients, and should be chilled in a fridge before serving – it tastes very good after being chilled overnight. To make it, you really just need that fridge, some ingredients, and a blender. One thing I like about Gazpacho soup is that it’s difficult to say it’s wrong since there are so many permutations of it based on local recipes (a bit like Miso Shiru!). 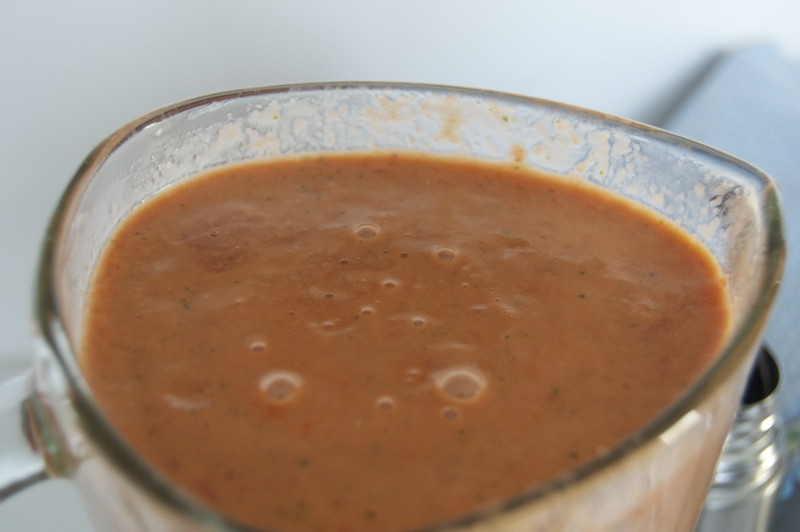 You can really blend it as far as you like – I’ve tried leaving some more chunks in there, and I’ve tried taking it all the way down to a thick liquid, and it tastes good most ways, so you can’t really over blend it. 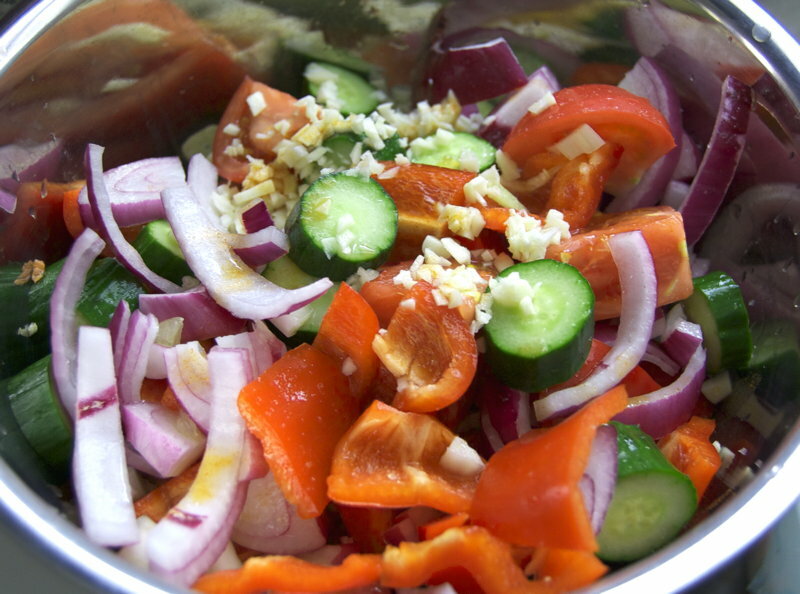 You can also add some ingredients at the end just diced if you prefer. There’s lots of ways you can do Gazpacho, adding a few things – I quite like adding a few olives, or sometimes a piman (a smaller Japanese non-spicy pepper) from my mini-garden. I’ve done some with several drops of Tabasco and it’s actually ended up really quite good for accompanying a BBQ, with that added spice and a drink. If you want it less spicy, you could add some cold boiled potato which would also thicken it up. Also, if you don’t think you’ve got enough liquid in there after a minute or so of blending, you can add some tomato puree or juice. Please post good variations in the comments!